As I experience pain and suffering in my racing and training, I can make it stop anytime I want. As a result of mental illnesses some people as they experience life don’t have that option, their pain and suffering goes on 24 hour a day, 7 days a week. Let’s help to bring a message of hope to these people. Click of the photo or here for the donation link. I have seen first hand the devastating effects that mental illness can have on people and the loved ones that surround them. The time has come for us to stop ignoring theses issues and to take real steps to get people the help that they need. 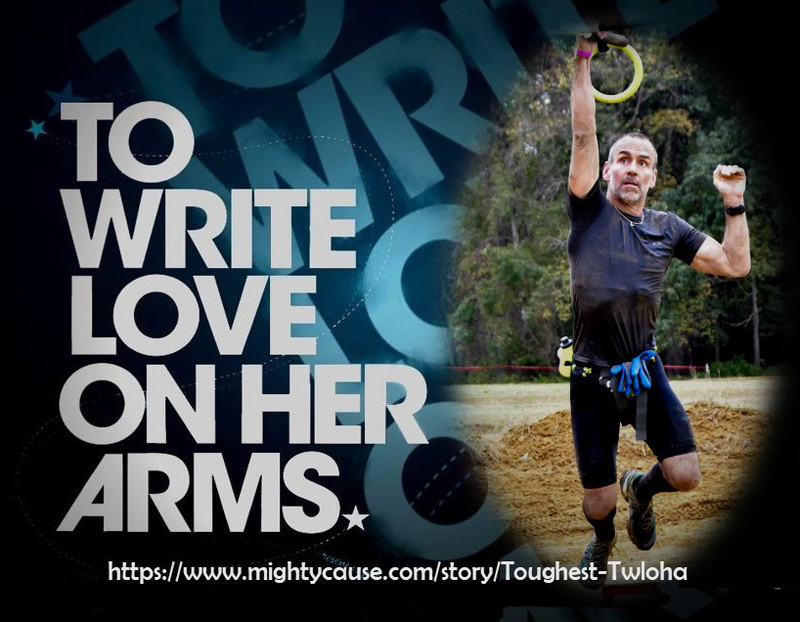 Once again, I want to use my racing and training as an opportunity to raise money for To Write Love on Her Arms a non-profit movement dedicated to presenting hope and finding help for people struggling with depression, addiction, self-injury, and suicide. TWLOHA exists to encourage, inform, inspire, and also to invest directly into treatment and recovery. I will be participating in the Toughest Mudder East on May 18th-19th. A 12-hour race that begins at 8pm and ends at 8am. The vast majority of the event will be taking place in the darkness of the night. I believe that this is an interesting metaphor for the darkness associated with depression and other mental illnesses. While this might be a demanding race, it is not nearly as difficult as living with the effects of mental illness. I have the option to stop and withdrawn from the pain any time I want, others don’t have that luxury. As the days lead up to any race my favorite thing to do is to check the weather forecast for the race and to fret about the worst possible conditions. For this race, the forecast kept wavering back and forth between 50° and raining, and 50° and overcast. Since the race was 5 hours long and I don’t deal with cold and wet very well I was hoping for the overcast option. Fortunately, when race morning rolled around the overcast option prevailed. Since I hadn’t been doing a lot of LONG ENDURANCE training and this was going to be my first five-hour+ race since the Killington Beast in 2016, I wasn’t sure how it was going to go, but was hoping for the best. For races Bonefrog sets up two courses, a Sprint (3+ miles) and a Challenge (6+ miles) and the Endurance makes use of both of them. It starts with one loop of the Challenge course and then you run as many laps of the Sprint course as you can until you hit the 5-hour time limit. My goal for the race was to earn my Gold Frog pin for a total of 5 laps. I also had spare shoes and clothes just in case I needed to switch them in the middle of the race. Plus, I had both my hydration vest and hydration belt since I intended to switch from the vest to the belt after the first lap. I wasn’t sure about how long the first lap would take or how well they had water stations spaced out so I figured it was better to have too much water rather than too little. I know from experience that I can’t play catch up with my hydration once it starts going wrong. After setting up my pit area, I take off my hat and jacket and head over to the start line. While I am standing there, I am thinking, this seems kind of cold so I put on my gloves just to keep my hands warm. Just as they start to warm up, the announcer says 3, 2, 1, GO! And we are off and running. These were taxing to say the least. Then we were back on the sprint course. Where we were met by an 8-foot wall and another gauntlet of obstacles. The Chopper I was able to figure out and make it through a couple of times and I could never get past the Strong Hold, the transition to the web straps got me every time. The rest of the lap was pretty uneventful until it was time for Black Ops. Once you crossed the bars it was time for the next lap. What was really amazing was how over the course of several hours, even the things that were easy in the beginning became difficult. The rope swing was almost impossible at the end because my grip strength was gone and I just slid down the muddy rope. It was incredibly frustrating to say the least. It was the same for the rope climb. Between the rope getting muddier and muddier and my grip fading, the last time was a lost cause with no chance for success. And the 8-foot wall? Without the side support, there was no way I was getting up and over. By the 3rd lap my ability to jump and grab the top of the wall was gone. The highlight of the day was finally figuring out and completing the Chopper and getting to kick the bell! (Boo to a certain other race that bans this.) And making it across Black Ops on all but two laps. I even made it across on my final lap! That was a great way to end my day. In the end, I did 6 laps – 18.7 miles in 4:56.30. I had the option of starting a 7th lap since I was in 4 minutes ahead of the cut-off; but, I was in no condition to “run” another lap. So I proudly accepted my medal along with 6 pins, one for each lap, including the Gold Pin for completing 5 laps. A very successful day! I finished in 6th place and as I looked at the results, was glad to see that not starting the last lap didn’t affect my placing. I have two things to share with the world. For some reason, over the past 11 months I haven’t had the motivation to sit down and write new posts. Hopefully, I have turned a corner and will get back to writing and publishing new posts. But that doesn’t mean my life has been boring. Since my last post in December 2017, quite a few things interesting things have taken place in and out of racing. I ran a couple of local 5ks and even managed to win my age group in one of them. It was a small perk of getting old. * These ones are most likely to get race reports written.